It came as a somewhat of a surprise this month when Quark Expeditions revealed that its 2018-19 Antarctic season would be led by a newbuilding that so far had not caught anyone’s eye. 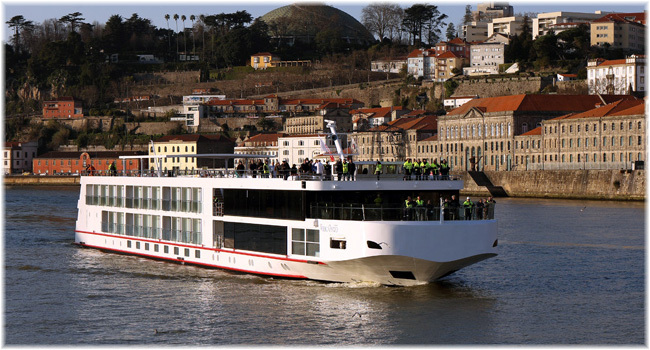 We have a look at Mystic Cruises, who will own the new 176-berth World Explorer, and the Portuguese shipyard it works with in Viana do Costelo. Meanwhile, a new passenger and container ship has recently entered service in China and we have a look at a ship design that, while particular to China, has also spread to Mauritius and French Polynesia. 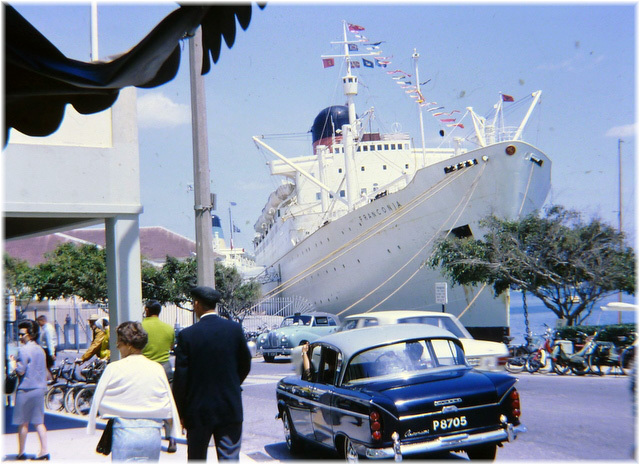 Finally, it is fifty years since Cunard Line announced that it would withdraw its iconic Queen Mary and Queen Elizabeth, so we look back to 1967. 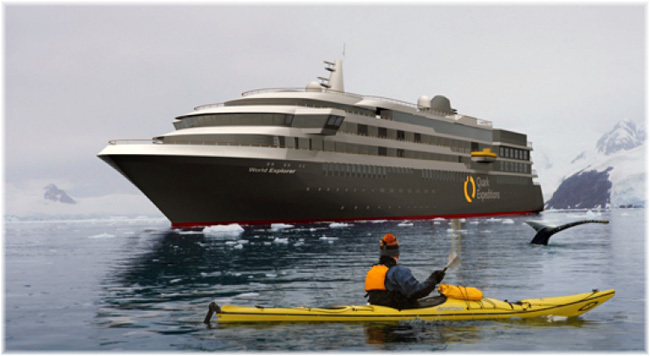 When Quark Expeditions recently announced its 2018-2019 Antarctica program, the highlight was that it would introduce the company’s first newbuilding, a luxury expedition cruise vessel called the World Explorer. Unknwon to the world, this 9,300-ton 176-guest vessel was under construction for Mystic Cruises at the WestSea Viana shipyard in Viana do Castelo, Portugal, which lies between Porto and Vigo. She will fly the Portuguese flag. TUI-owned Quark described the ship is an all-suite, all balcony, vessel with six premium suites. She will perform ten voyages during her first season in 2018-19 and every cabin will have either a private walk-out or Juliet balcony. The World Explorer will also feature plenty of public areas in which to unwind after a day outdoors, including a glass-domed Observation Lounge for quiet contemplation and full skyline views, the Explorer Lounge for a drink and a chat, and a library for reading. Presentations and discussions will take place in a dedicated lecture theatre. The new ship will have dimensions of 413 x 62 feet. Completed to Ice Class 1B, she will be powered by a twin Rolls Royce diesel-electric arrangement giving her a service speed of 16 knots. Westsea has been working on this project with Portuguese company Mystic Invest, which has already built a number of river cruise ships at WestSea, previously known as Estaleiros Navais de Viana do Castelo (ENVC). The WestSea yard is owned by the same Martifer Group, that owns a shipyard in Aveiro that also builds river cruisers. Mystic Cruises belongs to the holding company Mystic Invest that also owns river brand DouroAzul and the German river operator Nicko Cruises. Mystic acquired Nicko in 2015 and Nicko will market cruises on the World Explorer when she is not operating for Quark in the Antarctic. The initial Quark charter is for two years. 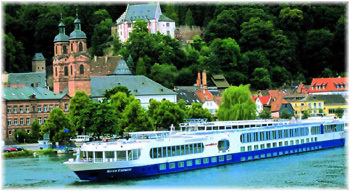 WestSea has built river cruisers for the fleet of DouroAzul, who operate three ships of their own but also charter several vessels to outside operators such as AmaWaterways, Avalon Waterways, Noble Caledonia, Riviera Travel, Uniworld, Vantage, Viking River and Voyages Jules Verne. Scenic and Emerald, meanwhile, have signed newbuilding contracts for several vessels directly with WestSea. The World Explorer will be the first of a series of expedition ships to be built by Mystic Cruises, which could reach ten units over the next few years. Construction of the vessel, reportedly designed by Italian naval architect Giuseppe Tringali, is now under way, with completion expected in October 2018. In the non-Antarctic season the World Explorer will visit small and distinct ports around the world that are not normally accessible to larger cruise ships. The 750-berth Ocean Blue Whale, a domestically designed passenger container ship, has just been placed into service on the Yellow Sea. 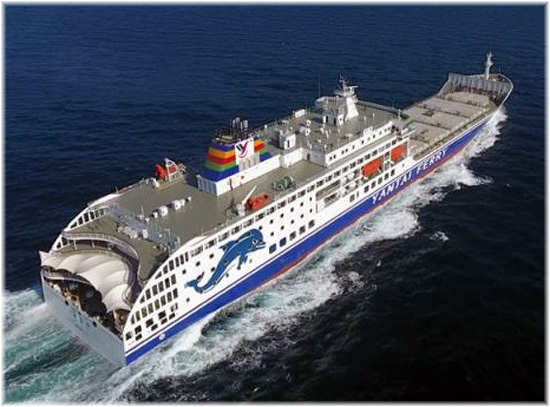 She has been built for the Bohai International Ferry and bareboat chartered to Yantai Ferry for the run between Yantai, in China’s Shandong province, and Pyeongtaek, South Korea. The design of this ship is unique, with all passenger accommodation aft and cargo space forward for 460 containers. This basis design can be traced back to a 1964-built British ship, the Blue Funnel Line’s Centaur, completed by the famous John Brown Shipyard in Clydebank in 1964 for the Singapore-Australia trade. After twenty years in that trade, the vessel was acquired by Chinese owners in 1985 and, as the Hai Da, became part of the Cosco group. When first acquired, the Hai Da ran alongside three other former western passenger ships, the Shanghai (formerly P&O’s Cathay), the Hai Xing (the former Dutch Randfontein) and the Jin Jiang (previously Matson Line’s Mariposa) on the Hong Kong to Shanghai route. This for many years formed China’s main shipping route for passengers. In the 1990s, it was decided to replace this aging quartet and China Shipping Group, now part of Cosco, ordered two ships each from the Merwede shipyard in the Netherlands and MTW Wismar in Germany. The European designers of the these vessels used the Hai Da as a starting point, although by now containers were also part of the mix. The ships were designed as long-distance liners but apart from two voyages between Singapore and Australia by the Arafura Lily, and brief service from Hong Kong to the Philippines, they have spent their careers on short routes across the Yellow Sea, the Hong Kong to Shanghai route having long since been abandoned to the airlines. About five years after the delivery of the European-built quartet, China began building such ships for its own account and ot produced two vessels of note. 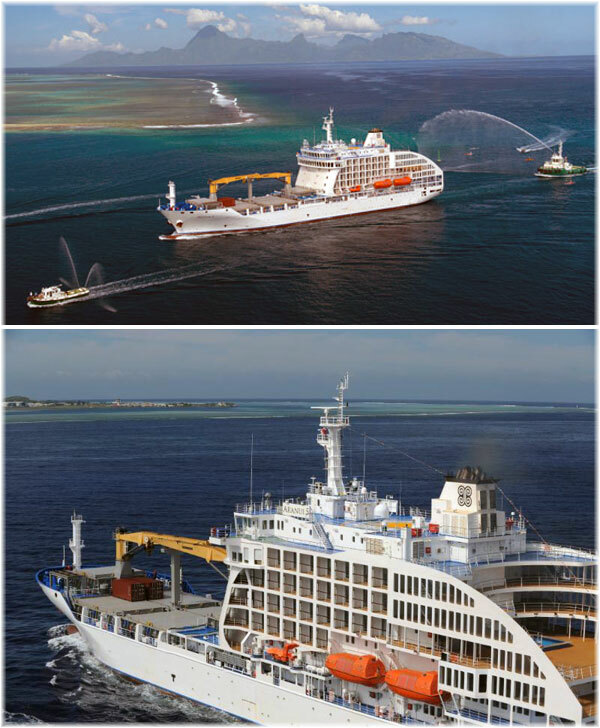 The Mauritius Trochetia built by the Hudong Shipyard in 2001, was designed for service between Port Louis, Mauritius, and Rodrigues, and the Aranui 5 was built by the Huanghai Shipyard in 2015 for the regular passenger and supply service between Papeete, Tahiti, and the Tuoamotus and Marequesas Islands. This same yard has just completed the Ocean Blue Whale. Meanwhile, the original Chinese quartet, and now the Ocean Blue Whale, today work for various ferry and liner operators running between Chinese ports and ports in South Korea. The original ship, Hai Da, was deleted from Lloyd’s Register in 2001. In June 1967, Sir Basil Smallpeice, chairman of the Cunard Line, made an announcement that was to reshape the way Cunard Line operated. The line had had heavy losses, amounting to £2.7 million, on passenger ships in 1965, and a 76-day British seamen’s strike in 1966 had cost it a further £3.7 million. In 1957, the numbers crossing the North Atlantic by sea had been 1,032,000, but by 1965 this had dropped to 650,000. Meanwhile, crossing by air had risen from one million to more than four million. Despite the fact that Cunard Line owned and operated the iconic 2,283-berth Queen Elizabeth and 2,129-berth Queen Mary, these heavy losses had to be stemmed. With falling passenger numbers, rising losses and very low passenger counts on winter voyages, Smallpeice really had no option but to announce that the two Queens would be withdrawn, with the Queen Mary to go that same year. Selling the Queen Elizabeth would wait until the end of 1968, as the Queen Elizabeth 2 was due to join the fleet in early 1969. Just a few months later, in October 1967, after more losses that summer, Smallpeice, announced further cuts. The 932-berth Caronia and 868-berth Carinthia and Sylvania would be sold as well. Only the 943-berth Carmania and 925-berth Franconia, which had both been converted for cruisng in 1963, would stay with the fleet long term. The Queen Mary accordingly left Southampton on September 16, 1967, on her 500th (and last) Transatlantic round voyage, and on October 31 she left Southampton for the last time, on a special long cruise for Long Beach via Cape Horn. The Queen Mary has remained ever since as a floating hotel and tourist attraction. The Queen Elizabeth would remain with Cunard Line until November 1968, and would be replaced by the new 2,005-berth Queen Elizabeth 2, in 1969. 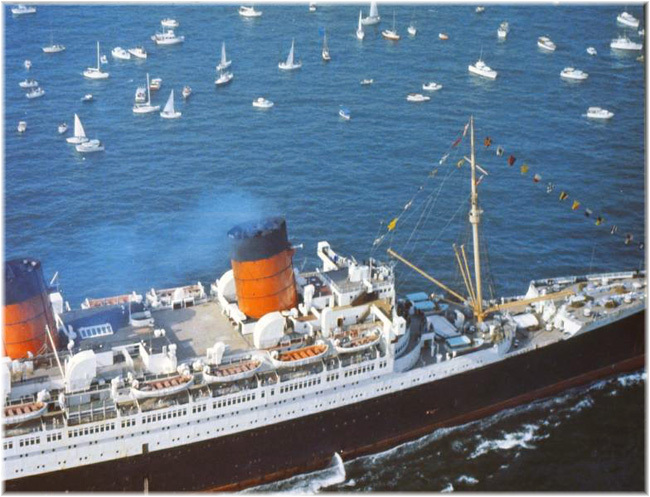 Like the Carmania and Franconia that she joined, the QE2 was a combined cruise ship and Atlantic liner. The Carinthia left Liverpool for Montreal on October 13, while the Sylvania left Southampton on October 20 and the Carmania on November 14. Although later Queens would cruise into Quebec from New York, these were the line’s last sailings from the UK to the St Lawrence. The Carinthia and Sylvania were then laid up until sold in 1968 to Sitmar Line, who converted them to the cruise ships Fairsea and Fairwind. The Caronia, meanwhile, completed her service for Cunard when she arrived back in Southampton in November. This left only the Queen Elizabeth, Carmania and Franconia to carry on, while the QE2 was launched at Clydebank on September 20, 1967. The Franconia, with her hull painted white, took over from the Furness Bermuda Line on the New York-Bermuda route, where she served for five summer seasons. She was not the first Cunard Franconia to serve Bermuda, however, as an earlier 1,700-berth namesake had done a single season on charter to the Furness Bermuda Line in 1931. By the end of 1967, with its three remaining ships, Cunard could count 4,142 passenger berths. Now, fifty years later, it counts three ships with 6,822 berths, a growth of almost two-thirds. The market for sea travel, meanwhile, has grown about twenty times.